I’ve been trying to explain to others (and myself) why I decided to transfer from Boston University (BU) to UC Santa Cruz, for over a year. Often I give the easy answers. I missed California. I couldn’t handle another East Coast winter. The culture of the elite private university was too competitive and uptight for my aura. You get the idea. Though all valid experiences, none of these were honest answers. In truth, my decision to transfer was highly personal. I needed to create my own college experience, one outside of the expectations and pressures of the traditional four-year college structure. 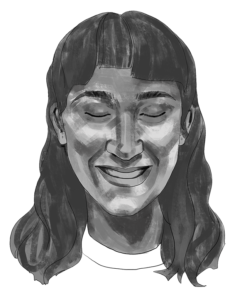 This illustration depicts the column’s author, Hannah Ross, currently in her second quarter as a transfer student at UCSC. Illustration by Kelly Leung. I did not realize this instantly. When I set out for Boston my freshman year I was full of misguided notions about college. I was ready to embark on “the best four years of my life,” college sweatshirt in tow. My expectations set me up for failure. No one tells young high schoolers what to really expect from college. I had visions of school spirit at hockey games, friends jumping out of every freshman dorm room and parties on the roof of the Prudential Center. Beyond academics, managing physical and mental well-being without family support poses new challenges when students find themselves in cramped living situations away from home, burdened by the stress of college social lives and exams. When I met these realities, I did not fare well. I contracted mono, faced struggles managing mental illness and felt embarrassed and disappointed that I wasn’t making friends as I had imagined I would. In retrospect, the rise in mental illness among college students and host of editorials across news outlets about Millennial disillusionment with higher education has reassured me I am not alone, and many others have had similar struggles. The structures that gave meaning to life in college — classes, extracurriculars, the library — quickly transitioned from sources of purpose and excitement to dread-inducing limitations. When I returned home after my freshman year, the photographs and relics in my childhood bedroom confronted me with the self I left back in California. Hannah before college was happier, healthier and a big nerd, who was always fired up about education. I wanted to get back to that. I took a year off of school to try and figure out what was holding me back from living my best life. I read books, I climbed mountains and I watched all of Downton Abbey in a shockingly short amount of time. I reached many conclusions about myself, but mainly the conclusion to stop living life with so many conclusions. Life from now on would be lived by a mantra of possibility, inspired by a new love of spontaneity and living outside of my own expectations. If my life were a Netflix special this would be the corny montage of me sitting at my computer for hours on end applying to transfer, set to slightly anxiety-inducing upbeat music. Even when I was accepted to UCSC, I was not convinced that transferring was worth it. Leaving BU would feel like giving up. I had worked so hard to get to an East Coast private school, I feared that transferring would invalidate all of my academic worth, that my other friends who had prospered in college would look down on me, that I had somehow failed myself and others, that I was a quitter. When I finally clicked the button and gave the electronic signature that sealed my undergraduate fate, I did not do so because I was certain UCSC would be better for me, but because I needed to free myself from the expectations and pressures that were dominating every aspect of my life. I don’t know if I like UCSC more than BU. Frankly, it doesn’t really matter to me. Forcing myself to make that statement would invalidate the time I’ve spent at both places, and each provided me with friends, professors and experiences that I couldn’t envision my life without. What I do know is that my life and undergraduate career feel more purposeful since giving myself the space to break from my own expectations. As the school year draws to a close, many of us, whether graduating or still with a few more years of school ahead, are beginning to think about what the world will hold after we leave the comforts of classrooms and libraries. Without the structures that have dominated our lives for the past 16 years, it’s important that we remember not to fear the potential of spontaneity, of non-traditional experiences.